It's been a while since I updated my blog. One reason is that I have been spending most days working in my studio on new designs. The new piece above is the new direction my art is taking me these days. I haven't quilted it, yet, but hopefully that will be soon. I have more designs of this type ready to create. These are all based on the photographs I took while hiking in the woods. I just got home after three weeks in Ohio. I was babysitting our son's dog and house sitting while he was on military duty. I am still unpacking and doing laundry. I had to do yard work right away, it's like Summer here in Virginia and the grass was out of control. My quilt guild is doing a dyeing class in my barn later this month, but no snow in Florida. Lovely! The colors are really gentle and you've handled the trees very sensitively. I would love to have walked there with you. I love this piece. 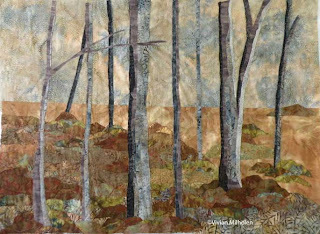 I also do quilts from my own digital photos. In my opinion, it doesn't need a border. I usually just put a narrow, 1/2 binding, often black, around the edge. It's a lovely piece. I agree with JYA: either no border or just a tiny black one 1/4" or less. My reason for thinking this is that the woods are BIG; when you walk in them you feel small. This piece right now has now edges so you are not framed in; it feels big. If you were to frame it; it would appear more of a post card to me. It would then become smaller. just my .02. Good grief, I wouldn't add a border or a binding. Just put a facing on it -- it's ART!! We all have our opinions on bindings and borders. My personal opinion for this piece is it needs a little charcoal gray or so binding without a border. I hang my pieces on my design wall and start putting strips of fabric on the sides. The right one seems to always appear during this process. You will know when you see it, or even without a border as suggested. It's a beautiful quilt. I feel as thought I could walk right into those woods. I would not bind it, but face it. Thanks for all your kind comments. I appreciate your feedback on the borders or not. I have decided to not add borders. I just stumbled upon your blog via Field Trips in Fiber blog and I will be going back to read as many as the posts I missed as possible. I really like your work. 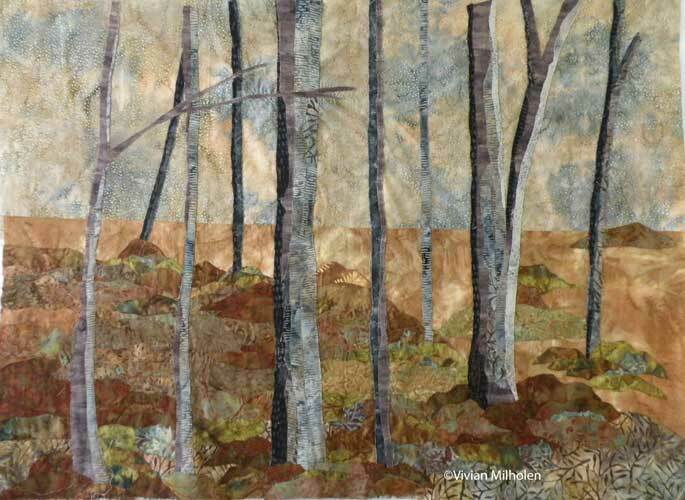 I am very drawn to nature inspired quilts. You have encouraged me to do a few things I have been thinking about recently. Thanks for that.